The journey to Timeless Quills Historical Romance has been a long and winding one, filled with rejection and uncertainty at times, and joyous celebrations at others. 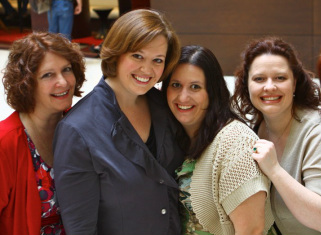 But through it all, the four women who make up Timeless Quills Historical Romance have stuck together and supported one another. It all started with a critique group -- a not-very-nice critique group -- in 2007, where Jane and Jerrica, the only historical romance authors, latched on to one another and didn't let go! A year later, they welcomed Ava Stone into the fold after all three of them participated in Gather.com's First Chapters Romance competition. Eventually, the three banded together and formed a historical romance critique group -- one that was based on mutual respect and the nurturing of budding historical romance authors. In less than 5 years, that group collected a bevy of wonderful authors, most of whom are now published or represented. It was Ava who found Rose and brought her into the fold in early 2011, though it feels like she's been with us forever! Eventually, Night Shift Publishing provided a home for all five historical romance authors and their manuscripts in ebook format. And the icing on the cake was receiving the request for print rights from Second Wind Publishing in early 2012. Both Night Shift and Second Wind have worked tirelessly to help us see our dreams come true, and we are forever grateful to both. Our hope for you, dear readers, is that we can sufficiently do our job to transport you to another time and place, help you forget about your troubles for just a little while, and maybe, just maybe, help you fall in love with Timeless Quills Historical Romances.